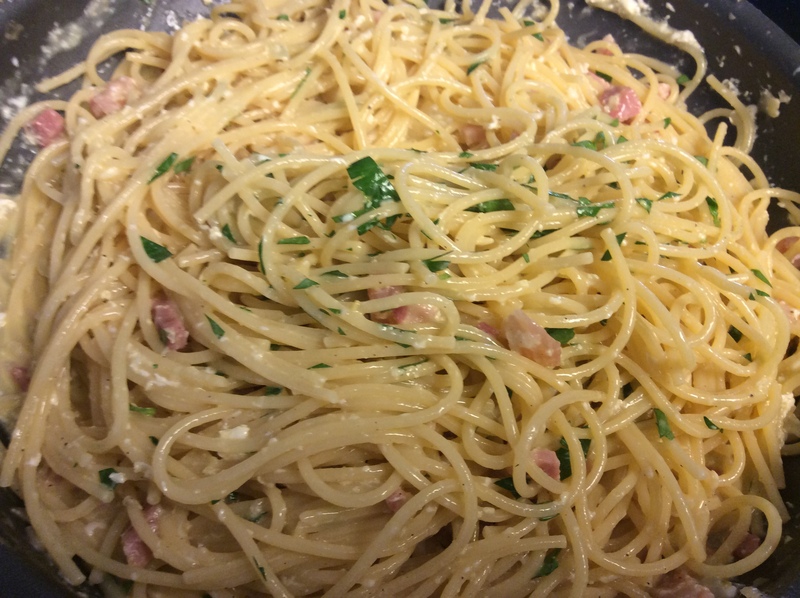 Spaghetti alla Carbonara | Let's Eat! ← Gumbo! New Orleans Style! 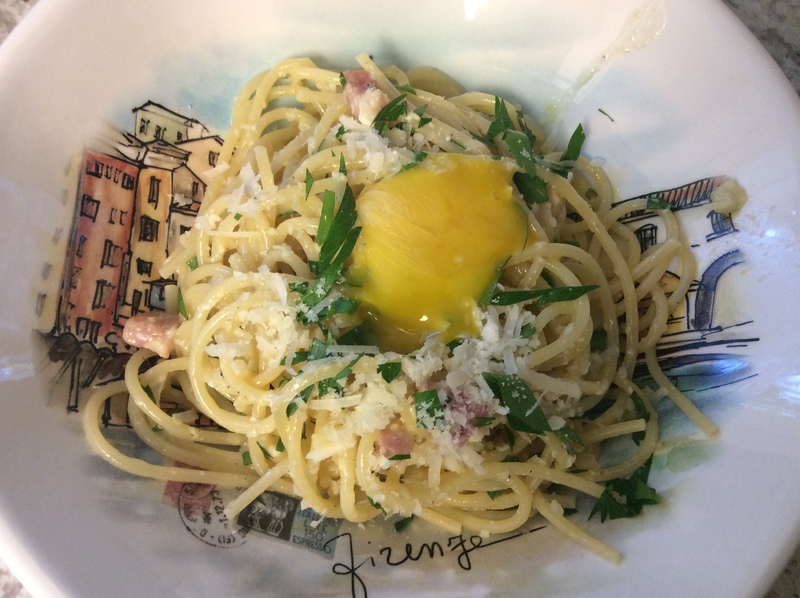 It’s hard for me to believe that I have never posted about Carbonara because it’s one of my wifes absolute favorites. On the three trips we’ve taken to Italy I think she’s tried them all! This recipe can be made with any kind of pasta but spaghetti and tortellini are our favorites. This is such an easy recipe and comes together as fast as you can cook the pasta, al dente of course! Start by boiling water to cook the pasta, per package instructions. 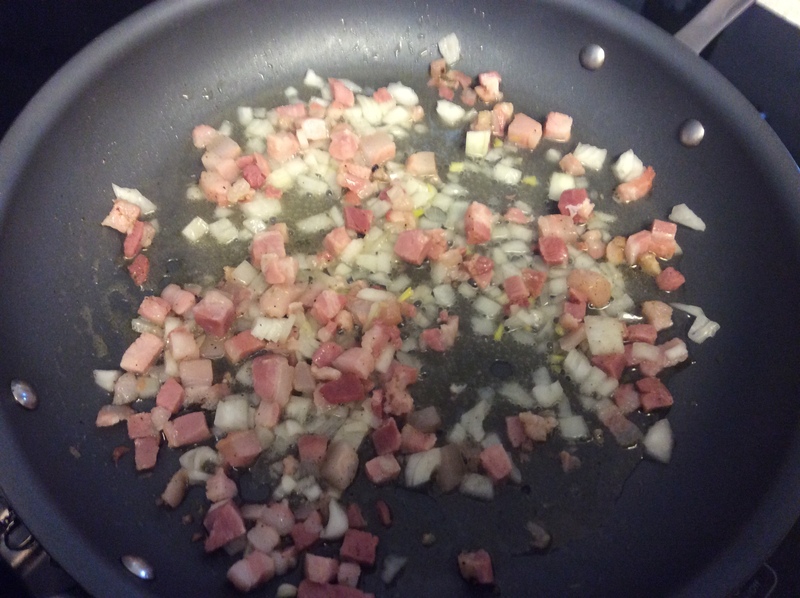 Just after you drop the pasta in the water, place the pancetta into a heated pan with the olive oil and heat on medium-high heat. After about a minute add the onion to the pan and lower heat to medium. Cook for two minutes and add about 1/2 cup of the pasta water from the cooking pasta. This starts a sauce in the pan and the starch will help begin to make the sauce creamy. Continue to cook until the pasta is al dente and drain the pasta but reserve about a cup of the pasta water. Add the drained pasta to the pan and incorporate all ingredients and add fresh ground pepper (to taste but don’t skip it!). Add a cup of the cheese to the egg yolks and incorporate. Remove the pan from the heat and add the egg whites to the pan and mix quickly to incorporate adding the reserved pasta water. Then add the egg yolk and cheese mixture and combine thoroughly. Top with fresh parsley and remaining cheese and serve! If you want to be adventurous, you can wait to add the egg yolk to the individual servings and let your guest mix it as they eat! 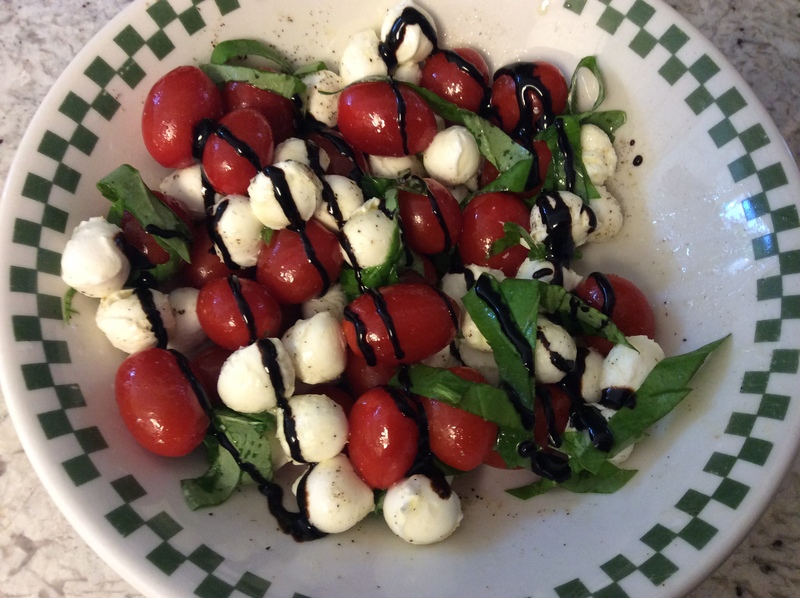 I served mine with a Caprese salad (tomato, mozzarella, basil, olive oil salt, pepper and balsamic glaze). Add some crushed red pepper to spice it up a bit! I love it that way! Check out more great recipes and stories at http://www.sundaywithachanceofmeatballs.com! 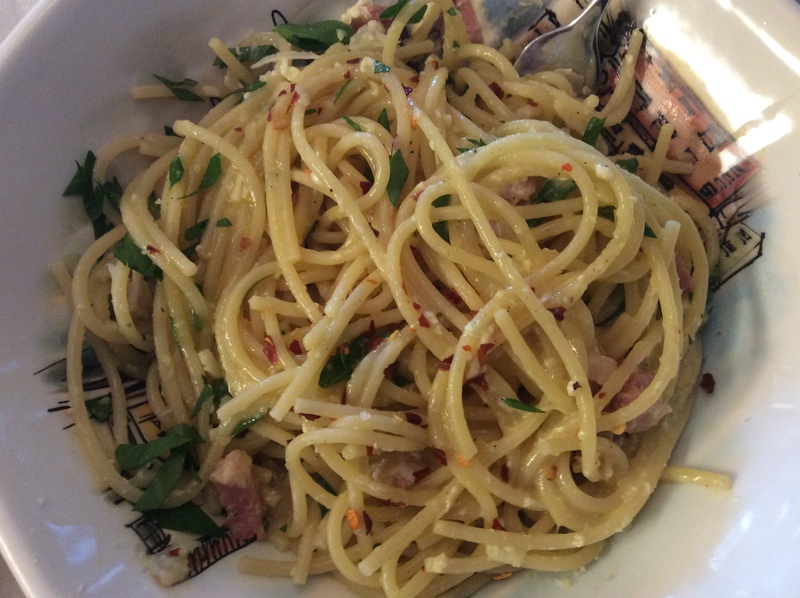 This entry was posted in Recipes and tagged Carbonara, Pancetta, Spaghetti carbonara. Bookmark the permalink.